The definition of holding a 'rag ace' or an 'ace-rag' is being dealt an ace with another card lower than a ten. 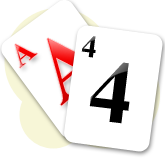 So the following hands can be regarded as 'rag aces': A9 A8 A7 A6 A5 A4 A3 A2. It could be argued the range, in which the term rag ace incorporates, is smaller or greater than the one shown. For example some would say that a rag ace ranges from A2 to A6, but in my opinion the best way to determine an ace rag is in the range A2 to A9. In a nutshell, a rag ace is an ace with a low kicker. How to play aces with low kickers. More often than not you should be folding rag aces. This may come as no surprise to any intermediate and experienced players as they have read this article or other articles like this, and learnt from mistakes they have made at the table. You should always look to fold rag aces, as they will rarely win big pots and are likely to lose you a fair amount of money if you are out-kicked. If you play rag aces, you are primarily looking for one thing to happen: making top pair with your kicker on the flop. This is because this gives you the best opportunity of having the best hand and to make money. If you pair your ace and get action from another player it is likely that they have your ace out-kicked, especially if they raised before the flop. There may be a slight chance that your opponent is playing a rag ace worse than yours, but you can never be sure of this and it is never ideal to be putting money into a pot when you do not know where you stand. Tips for playing rag aces. 1] If you pair your ace and bet out, your opponent will only be calling/raising with the better ace leaving you unsure of where you stand, or they will fold an obvious worse hand – winning a small pot. Furthermore if you were to hold A5 on a board of AJ8, any action you would get would either result in you losing the pot or calling to win half. In the best-case scenario of your opponent holding an ace-rag, it is likely to be a split pot by the river. 2] If you make top pair with your kicker you have a better chance of making more money from another player that has hit top pair with a worse kicker. However this situation is unlikely and again with one pair you can only hope to be winning a small pot. 3] You make two pair on the flop against someone with an ace but with a better kicker. This will usually be a profitable situation for you. However it is not common and it would be a losing play attempting to make two-pair with a rag ace against an opponent with a better kicker. It simply won't happen enough to make the call profitable. Rag aces do not win big pots. As highlighted in bold, the key idea to remember with rag aces is that they are not designed to win big pots, and if you happen to make that two pair, it is actually going to be a losing play in the long run. Just think about it. If a player raises you with his AQ and you call with you A6 to see a flop, who do you think will be coming out on top the majority of the time? Hopefully this has drilled into you that you should get away from rag aces as often as you can – save yourself some money at the table. When can you play rag aces? In spite of what has been mentioned above, there are certain situations that warrant playing ace-rag in the hole (remember that no answers in poker are that straight forward). When playing short-handed poker you can loosen up your starting hand requirements. When there are 5 people or less at the table it is acceptable to play any ace with good table position. Rag aces can be played more profitably at short-handed tables, but you still have to be careful. Rag aces are generally best avoided if you are still developing a solid, winning strategy. The likelihood that your opponents will be holding any aces has diminished significantly enough to change rag aces from losers to winners. The rule that you may only win small pots still applies, but the size of these pots will be slightly increased short-handed, as players will have a tendency to call bets with middle pairs. Furthermore, an ace also acts as a plan B for clearing up uncontested pots with the high card. But be sure to let paired aces go if you come up against too much action after the flop. Blind play with rag aces. In addition rag aces are better suited for blind play (play within the blinds and button) for the reasons mentioned above, as once again there will only be a small number of players left in the hand. It is likely that you have the best hand so the optimum play is to raise with any ace if it is folded around to you on the cut-off or on the button. If your opponent does call than you can evaluate how to play the flop with greater accuracy as you have position on your opponent. When in the small blind you should once again raise and hope to take the big blind. If your opponent does call then a continuation bet on the flop is likely to take the pot down. When on the big blind with an ace rag you should raise if you feel you can take the pot otherwise it is best to check, as you will be out of position for the hand. When you do play rag aces, you should keep in mind two key words: Isolate and Determine. You should realize that rag aces are not the kind of hand that you want to be playing in a multi-way pot. Therefore you will want to isolate any possible opponents by raising to keep the action heads-up if possible. If you do get the call off one opponent, you will then need to determine the strength of your opponent's hand and if they does indeed hold the better ace than you. There are no tips or rules to know whether or not he does; you simply have to have a good understanding of your opponent and the way they play. If you are unsure of how to play rag aces, then you should fold them. If you are relatively new to poker then rag aces are either going to win you small pots or lose you big ones. This type of hand is simply not designed to win big pots and that does not help with the main aim of poker - making money. This risk you are taking to win a small pot is outweighed by the risk you are taking of losing a big one. There are some situations in which you can profitably play ace-rags, but the profitability margin is not great enough to concern yourself with these sorts of plays, especially if you are unsure of what you are doing.